When running is in your blood, you can hide – and hike, cycle and swim – but you’ll eventually have to run. Karen Brough has hiked all over the world. She’s completed the Annapurna Trail in the Himalayas, walked the El Camino from France, trekked across the Pyrenean Mountains to Santiago in Spain (900kms in 20 days) and climbed Kilimanjaro just for the views. Karen has also cycled thousands of kilometres on her bike – her greatest achievement in this space was raising over a million rand for charity by doing a series of long distance peddles from Johannesburg to Maputo, Johannesburg to Cape Town and Johannesburg to East London. 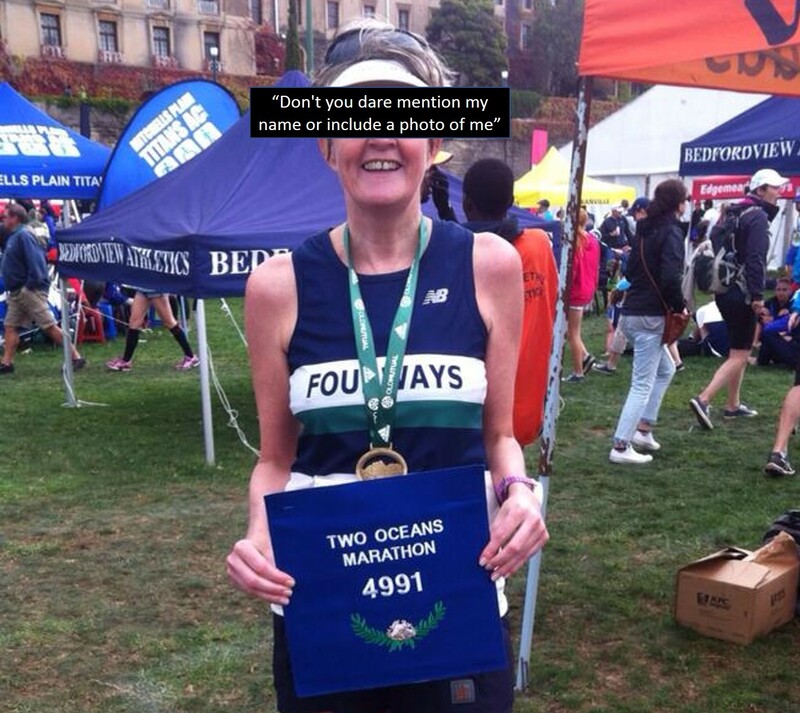 This story was confessed to me by a club mate who made a terrible mistake during her first Two Oceans Marathon in 2004. It still haunts her to this day and she doesn’t want other novices to repeat the same grave error of judgement. She is still acutely embarrassed by her naïve blunder – so much so that she only agreed to share her story under condition of anonymity. Therefore, I have decided to respect her wishes and will refer to the protagonist of this story under the code name BN4991. Rikki’s mom had lost contact with her favourite cousin-once-removed, Wesley Tiedt, for over 40 years until Facebook intervened and facilitated a happy family reunion in Johannesburg. They spent the Christmas of 2017 together on Wes’ farm in St. Francis Bay. 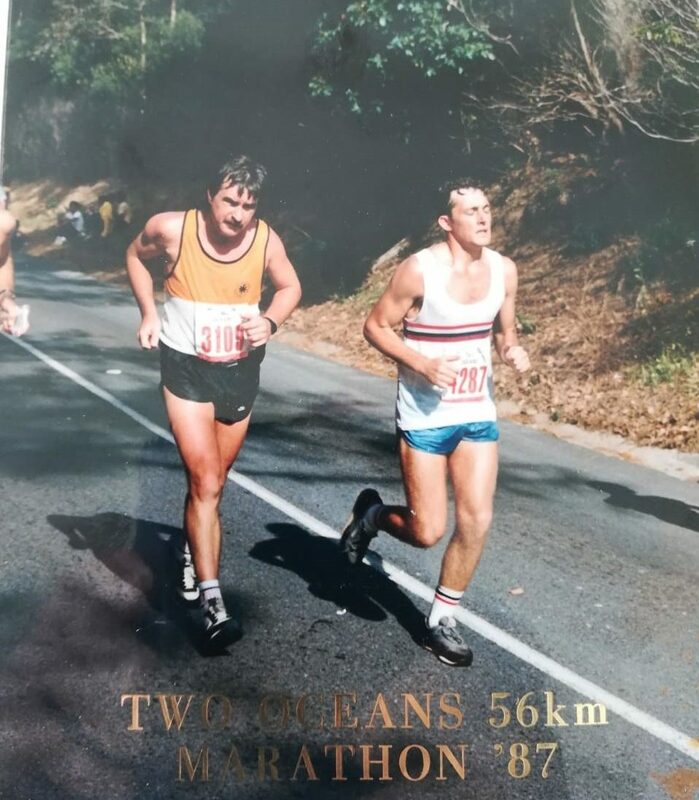 Rikki was paging through a photo album when she stumbled across the picture below of Wes running the 1987 Two Oceans Marathon. Photo finishes are commonplace in athletics but this photo was about initiate a major change in Rikki’s life. Wesley Tiedt (left) on his way to a 5:58:14 finish at Two Oceans Marathon 1987. No time to walk up Constantia Nek as the cut-off time was 6-hours in those days. On the 6th of April 1985 two men completed their 10th Two Oceans Marathon voyage in just under four hours to cap their Blue Number run with a silver medal. Louis Massyn, clocking in at 3:57:30, received Blue Number 35 and less than a minute later Tony Abrahamson, 3:58:18, lined up behind him to collect Blue Number 36. That was 34 years ago – a year in which Mikhail Gorbachev became leader of the Soviet Union, Michael Jordan was named NBA “Rookie of the Year”, a 17-year old Boris Becker won Wimbledon for the first time and Marty McFly went Back to the Future. 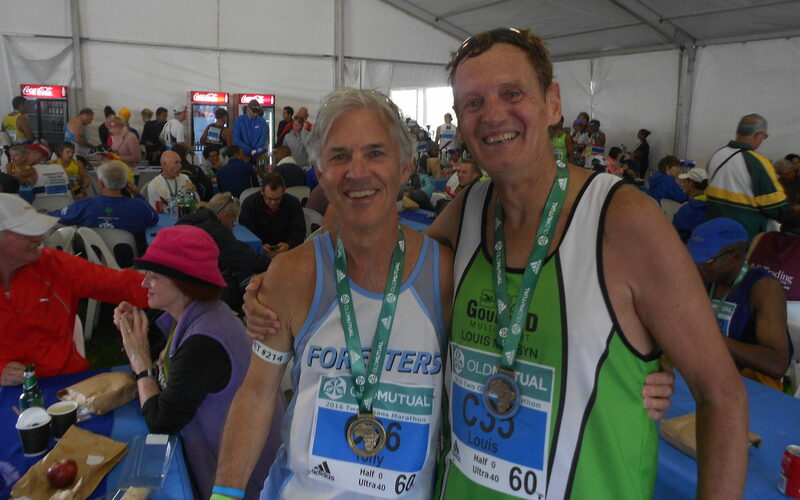 It was a long time ago but neither of these proud 1985 Blue Number recipients has missed a Two Oceans Marathon since then. Together, they have a combined grand total time of 211 hours 25 minutes and 54 seconds on the Two Oceans route (that’s about 17.5 days). 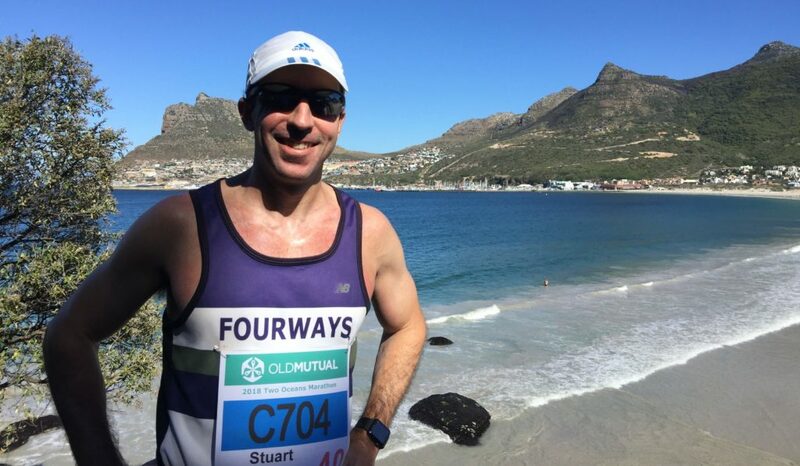 Although Louis has a faster PB (3:41:15 to Tony’s 3:52:12) and six silver medals (to Tony’s four), Tony ‘s average time of 4:55:01 betters Louis’ average of 4:59:07. A friendly rivalry – Louis and Tony in the Blue Number tent after their 41st voyage. 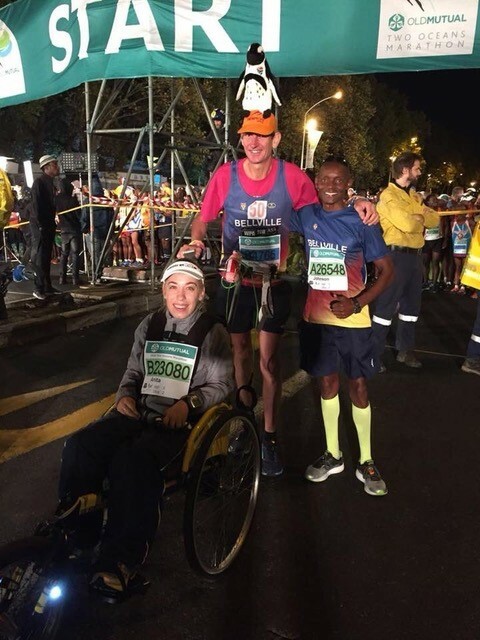 I’ve been gathering Two Oceans advice from a number of different athletes of all abilities. There is one common answer across the spectrum – take the first half of the race easy because you’ll pay significant interest charges over the much tougher second half. Therefore, I wanted to make sure we got some input from the person best qualified to inform us what happens on race day when “a push comes to shove” – and that person is undoubtedly Hilton Murray. Team Blitsie before the 2018 Two Oceans Marathon. Some people have mid-life crises but Alison Smith questioned her entire existence. One morning 9 years ago Alison awoke with a start and queried her Cape Townianess. Despite living in the city all her life, she realised she had not participated in either of the Mother City’s major sporting events. 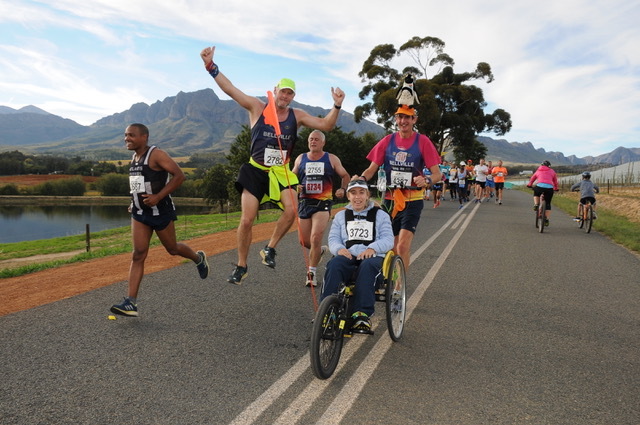 There is a lot of debate about what constitutes a ‘real runner’ but for Alison is was blatantly obvious that all ‘real Cape Townians’ had to peddle the Cape Town Cycle Tour or run Two Oceans to authenticate themselves. Is Road Running Still (Unconsciously) Sexist? On my social media profiles, I profess to be a “Trainee Feminist”. As the lone male in our household (even our cats are girls) I might joke that this is merely a survival tactic but, having been blessed with two daughters, it is actually a genuine attempt at improving myself and the world into which my daughters grow up. 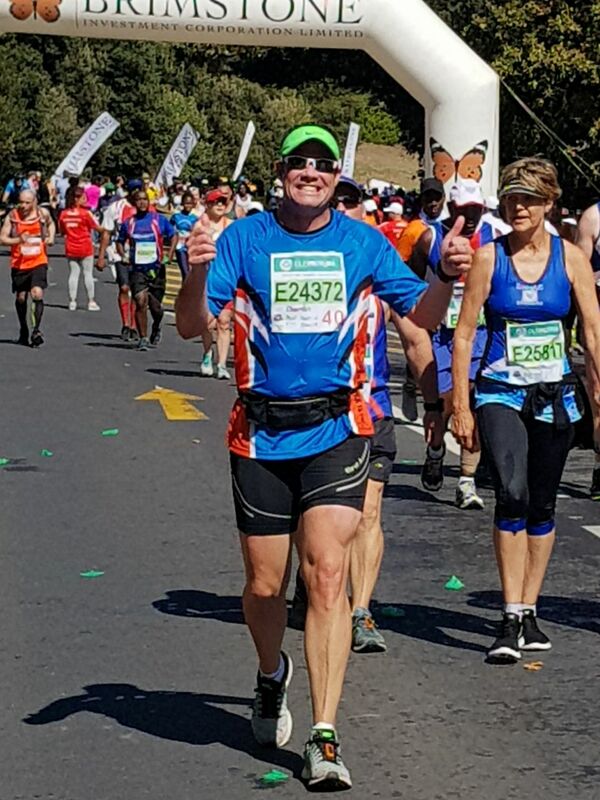 I recently wrote an article on the oldest road race in Johannesburg, the Jackie Gibson Marathon. 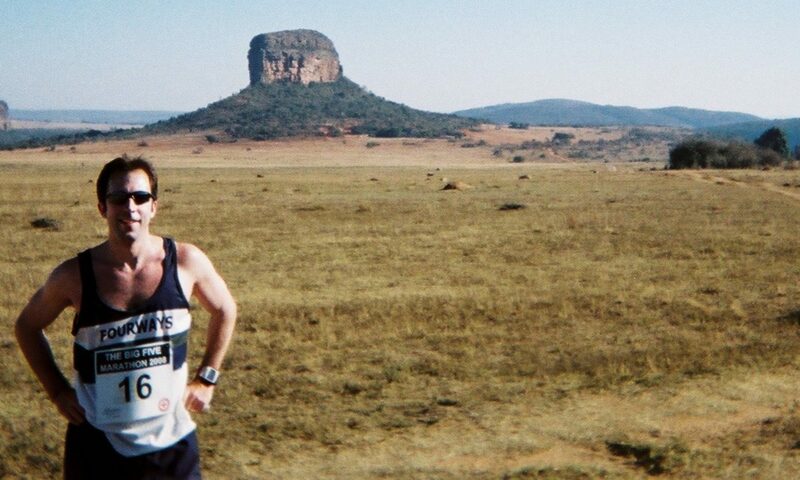 The race also has a half marathon named after another South African running legend, Allan Ferguson. I thought I’d done a pretty good job conveying the personality of the marathon – as well as highlighting the impressive achievements of both gentlemen which resulted in them getting honoured with race naming rights (Allan Ferguson actually has two road races named after him – as far as I know the only person in the world to be so honoured). 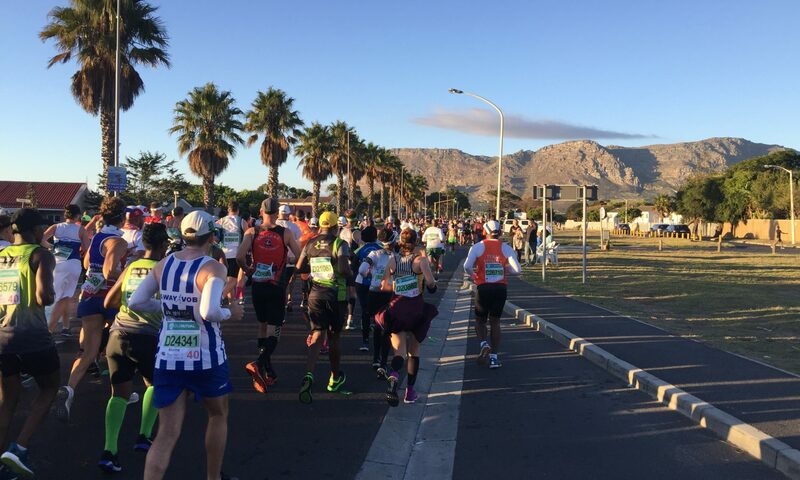 South Africa hosts the two biggest (and greatest) ultra marathons in the world: Two Oceans and Comrades. I’ve been asked many times about the difference between the two. My philosophical view is that if you are a teenager in love, Two Oceans is the sweet, charming, beautiful girl that you should marry. Comrades is the girl that’s way out of your league but is malevolent enough to string you along, thinking you have a chance – only to break your heart (and your body) after crushing your spirit and ripping out your soul. It’s got to be a special race when you’re this happy at 38km (and still have 18km – and Constantia Nek – to go).